I wrote this post a while ago, but never published it. Updates about Kunming are coming soon! Laos- my favorite travel destination! My favorite page in the photo book is the map page, where I explain that I lived in Dalian (Yes, it is very close to North Korea). 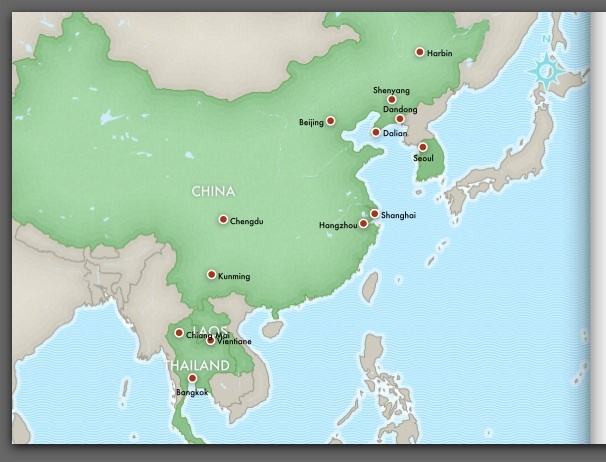 I can also point out that when I go back I’ll be living in Kunming, located in the the southwest. It’s like moving from New York to Texas. Different food, different culture, different people and different climates, but still the same country. On the map I also marked all of the places that I visited. Looking at the map also helped me to realize how much traveling I did. At times I felt like I wasn’t maximizing my time, but when I look back at my pictures I feel very satisfied with the places that I went. In the US this summer, I’ve been in Pennsylvania, New York, New Jersey, and Virginia. It’s been great to see high school friends, college friends, China friends and relatives. I leave for China on the 29th, and I can definitely say that I’m ready to move to Kunming and settle down into a new city, new job and new routine. What a great idea!! Please visit me in Xi’an if you have not been and want to check it out. I hope you are settling in and doing well!